Users of this website are bound by the following terms and conditions. If you do not want to be bound by the following terms, please do not use this site. Thank you. All materials copyright 2010-2019 by Low-Back-Pain.Org and the author. No material may be reproduced, in any form, without written permission from the author. Anyone who steals, borrows, or uses any material from this website, without permission, will be prosecuted to the fullest extent of the law. All violators of this copyright will be liable for all legal fees associated with prosecution and/or litigation. 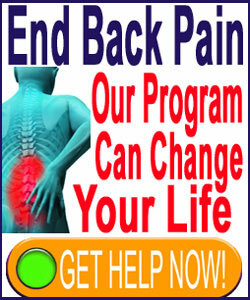 This site is funded by sales of the book “Cure Back Pain Forever” and by donations from readers. This site contains advertisements. These ads have the potential to generate income, but income is not guaranteed by their inclusion on this site. Any and all correspondence you receive from this site is due to you signing up for our mailing list or submitting feedback. We do not allow any other entity to use our mailing list. Our newsletter is only available if you request it, and you may unsubscribe at any time. To unsubscribe, simply follow the link at the bottom of the email. All reader submissions, ideas and articles become the property of Low-Back-Pain.Org. Please do not send us your ideas unless you want us to use them. Do not expect payment for any submissions. All submissions used will credit the author, but we will not provide any additional compensation. We maintain the right to edit, or reject any submission, for any reason. If you do not agree to these conditions, please do not send us your feedback, submissions, or ideas. This website is not intended to diagnose, treat, or cure any condition or disease. The material contained herein is thought to be accurate and correct, but no claims to the actual accuracy or validity of any idea or claim are guaranteed. No advice given on this site qualifies as medical advice or treatment. Use of this site or any correspondence is not a substitute for medical treatment. Information offered on this site may be based on clinical research, medical text (cited in source materials page) and/or personal experience of the author or contributing editorial board members. No claims are made to the universality of any medical treatment, diagnosis or product. Low-Back-Pain.Org does not endorse any product or procedure in exchange for monetary or other compensation. If an endorsement is given, it is simply because the product or service worked well for us. It does not guarantee that it will work as well for you. You agree to indemnify and hold Low-Back-Pain.Org, it’s contributing authors, owners, employees, ISP’s and other companies and individuals affiliated with Low-Back-Pain.Org, harmless against any losses, claims, damages, liabilities, actions or other repercussions or effects arising in connection with use of this website or any correspondence. In no event will Low-Back-Pain.Org be liable to you for any actions, decisions or losses related to, or arising from, your use of this website or any correspondence. The author and Low-Back-Pain.Org is not responsible for the actions of any individual that may occur as a result of reading this website. We do not make any representations that this website will benefit every individual. The ideas in this website will not represent the opinion of everyone reading it. If your opinion differs, feel free to start your own site. This site is not responsible for damages to your computer or other equipment that may result from you visiting us. This site links to other sites, but is not responsible for their content or reliability. We take no responsibility for your decision to visit any link off this site.